"Right when he was getting ready to pass me, he punched me in my left temple"
Here's the scenario. 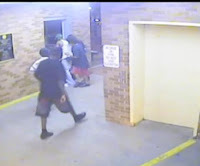 A very small number of isolated black teens have a game they play called the "knockout" game where they film each other finding some random person on the street and punching them unconscious. Then they post it on Youtube. It's a non stop laugh riot. This doesn't happen a lot, but it has been going on a while now. It doesn't get much press attention, mostly for the reasons you would expect. Well this time two black kids found an old man and filmed themselves punching the guy in the head. Ha ha, he fell down unconscious, time to post the video. Except this time, the old man died. So the cops saw the video and caught the two kids, and they're going on trial for murder. Now, consider this alternative scenario: the old man is armed. Kids come up and start to hit him. He shoots one to death, and the other flees (or perhaps he shoots and kills both). Now, imagine the news of a white man shooting one or two black teenagers. What would that be like, do you think? Except he died from their attack. So his self defense with a deadly weapon would have been justified. But you know very well that he'd be portrayed as a racist monster who killed kids. The press would run photos of these teens at their most angelic and find one of the old man looking like the emperor from Star Wars. President Obama might mention how those boys look like his son would. Sharpton and the usual suspects would probably show up and protest, calling for justice. Would the New Black Panthers put up a wanted DEAD OR ALIVE poster? That old man is dead now, for no reason other than these youths thought it would be funny to attack him for no reason and leave him on the street. All so they could have a video on Youtube and feel cool and have attention. Imagine what the reaction in the press would have been like if he'd defended himself and one of his attackers was dead, instead? And this isn't the first old man to be beat to death by black teens playing this game. One claims to have knocked out 300 people - an extremely doubtful claim, but a telling one. Funny how when black teens target white people for violence, its not declared racist and it gets virtually no press coverage.